Leah and Jennelle created these awesome tools for us to print and give to our new members! - 4 Day Loan A Diffuser document you can use to share with potential customers. You are welcome to print them wherever you would like. The recipe cards are business card size. Moo.com is the only printing site that will allow you to have multiple different "backs" on your business cards. You can leave one side blank or add your contact info in and then the "backs" would be the recipe cards. You can order 1" binder rings from Amazon or grab them at an office supply store. Click the image to get to the file. Becky Fox Rademacher designed these for us to print or email to our new members. This 13 page booklet is beautiful and super helpful to walk new members through their kit. Click the image to get to the file. I created these for my new members and members that have never ordered after the kit, that are a little intimidated by oils and need some extra help. So far they adore them! I order the mini business cards from Moo.com. The front of all the cards I use the Fall In Love card and Moo allows you to do up to 100 different backs. I did 20. I use 1 inch colored binder rings from Amazon or an office supply store and a 1/8 inch hole punch to make the hole. Without any discounts they will cost about $4-$5 a booklet to make but well worth it. My members love that they only have PSK oils so they can do EVERYTHING in the booklet and that it is small and straight to the point. No thinking required. Click the pic to get to the file. Please do not share link outside our team. THESE BANNERS were made just for us by the super talented Meghan Oeser! You can get a great deal if you order from VistaPrint during a sale. You will want to order a 2x6. These are great to make your table stand out and look more professional at vendor events. HERE is a folder with 11 slides with different oils in the PSK created for those that speak spanish. The Mix Life graphics are created by Monique McLean our upline above Lindsay Moreno and are FREE for us to use!!! How awesome is that? Lemondropspot.com was created by Lindsay Moreno. You will get a few shareable graphics per month that look professional and have your name on them. There is a cost of $5 per month to subscribe. 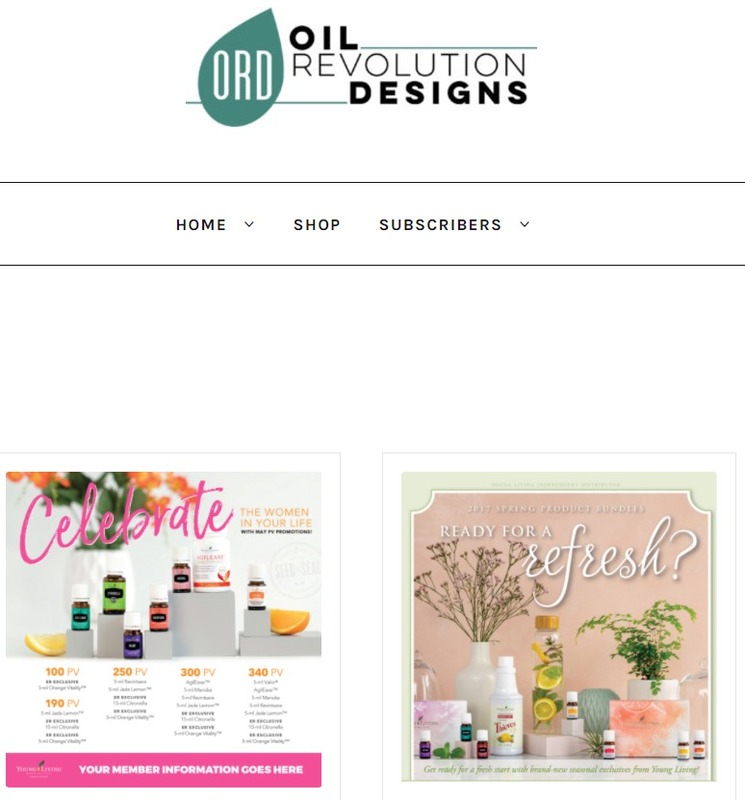 Oil Revolution Designs (ORD) is another website you can subscribe to for $5 a month and get professional graphics. ORD also creates a monthly class with different topics each month. They too will have your name on them and are great to run in chat groups. ORD also has wonderful printed marketing materials and a very fair cost. The Gentle Babies book is written by RCD Debra Raybern. It has great tips for pregnant and nursing moms and for tiny babies. Not too many of us have a ton of experience in that department so this book is a must have! You can buy the hard copy HERE or the PDF ebook to have on your phone at all times HERE. Essential Oil Pocket Reference or as we lovingly refer to as EOPR or Oily Bible is the best book to have on hand. It has all the uses for all the things and is great to help research oils. Gary Young helped write it so it is straight from the brain of the oily genius. They are $12.95 each but if you buy 10 or more they are $10.95 so you save $2 each. Download this app RIGHT NOW. It will be the best $6.99 you ever spent. Promise. All the oils. All the uses. Right at your fingertips. The Farmacist is a page by Dr. Lindsey Elmore. She teaches all about the science of essential oils. She is brilliant and really has a way of making it all make sense to those that don't have science backgrounds. There is a paid option and also some free videos. If you follow her on FB she does live videos there as well. She also has a new book called Essentials: 50 Answers To Common Questions About Essential Oils. A worthy purchase for sure! Oily Tools is the BEST business tool ever! It shows you day to day what your paycheck will be and helps you keep track of your downline. There are a million different ways to use Oily Tools from seeing who is missing out on a check in your downline to printing labels to calling your team members or customers. It is brilliant! The cost is $6.99 per month and totally worth it once your downline starts to grow. Cinchshare is by far my favorite scheduling software. When I am running classes it helps a ton to have the posts scheduled for specific times so I can go in and comment and interact with those who are present rather than preparing the next post. It also works for when I commit to posting but can't be near a computer during my assigned time or I get too busy and forget. It is $10 a month and you have the option to pay $2 a month to put account on hold. There are free sites as well including Buffer and Tiny Torch. I personally have never used them because I absolutely love Cinchshare but I think they are a great place to start! **Facebook now gives you the option to schedule posts. Taxes...a necessary evil. The TaxBot app makes the dreaded tax time a breeze. It stores receipts, checks mileage and makes sure you are getting back EVERY penny you deserve. It is a discounted price of $5 per month because you are with Young Living! There is also an awesome Facebook group you can join all about taxes called Young Living :: Taxes and More where you can ask questions about deductions and check out some awesome tips! Our amazing RCD upline Lindsay Moreno wrote Getting Noticed as a quick guide to social media marketing. This book is a simple read that will have you nodding your head YES the whole time! Lindsay has a brilliant mind and has done an amazing job building her brand. You definitely want to check it out. Lindsay Moreno also has a podcast called Boss Up. They are short and sweet and pack a punch. They are a MUST for all #ladybosses so get on over and listen when you have 10 minutes to kill. Oil Revolution Designs has a LAUNCH KIT of awesome business tools designed to help you LAUNCH your business! Perfect to snag for yourself or to ship to a new business member on your team! Starter Guides are FDA compliant and include 20 pages which feature the Premium Starter Kit with Vitality and the NEW Essential Rewards Program (updated September 2016). Oil Ability is a site ran by Diamond Sarah Harnisch. She wrote a book called GAMEPLAN as well as a Workbook and the videos that go with it are on THIS page.. There is definitely some wisdom to be found in both the book and videos and while it is not exactly MY path it does not mean it cannot be yours. So I made sure to include it here and let you decide if it is for you. "Gameplan will teach how to fill classes without knowing people, the six mistakes every stagnant business builder makes, why you don’t have to be the expert to share about oils, how to deal with no’s, the top distractions that can derail your business, why you don’t need to “sell” anything, and more!" Young Living has a FLICKR PAGE full of images that we can use to promote products. They have individual bottles that you can use to put on top of other images too, like adding a bottle of oil on top of a background. Just make sure when you download you use the ORIGINAL size option. I heart Pixabay! They have amazing FREE images on their site that you can use freely without licence. Stock images are NOT cheap so I always check here first before I buy from Big Stock. I use the images to create graphics but PLEASE know that you absolutely don't have to know how to make them. We do our best to provide them to you for all different classes, contests, events and promos. Canva is a website with more options for designing than most phone apps. There is a free version and a paid version. I personally have not used it because I use PicMonkey or Photoshop but I have heard the free version is fancy enough. HERE is a quick tutorial. PicMonkey is my FAVORITE program to use to create graphics. It is MUCH easier than Photoshop and creates amazing images with little know-how. You can watch tutorials on the site HERE. I usually just Google what I want to accomplish and add the word tutorial to it and there are a million YouTubers that went ahead and simplified all the steps for me. There is a paid and free version. Free should be fine for most that are using on occasion. I made a quick tutorial HERE showing how I would make a quick graphic for a class. Word Swag is an excellent app for making quick graphics on the go. It was mostly geared toward a quick quote but you can add your own pic background and add text over the top or just use it for quick announcements etc. Totally a worthwhile investment if you are upping your social media game and want more profesh looking images. Photofy is my FAVE app for editing pics or making oil posts on the go. I can throw a quick filter on a pic and text if I want and done. There are tons of stock images to use as backgrounds as well as stickers and custom artwork. Definitely worth it to have more quality looking pics show up in your newsfeed.